David Beckham and fans celebrated on Monday after the announcement of Miami's MLS team. South Florida is set to be home to a Major League Soccer franchise for a second time as the league announced Monday its latest expansion team will go to a group led by soccer legend David Beckham. The sold-out announcement event inside the Adrienne Arsht Center attracted city and county officials along with some of the top names in the sport, including Beckham and league commissioner Don Garber. It comes four years after Beckham first announced plans to bring a team to the city of Miami. Miami's as-yet-unnamed team becomes the 25th to take part in MLS, with their first season of play expected during the 2020 season. Beckham's group of investors includes Miami natives and businessmen Jorge and Jose Mas along with Sprint CEO Marcelo Claure. Beckham will be the first former player to own a team, according to the league. 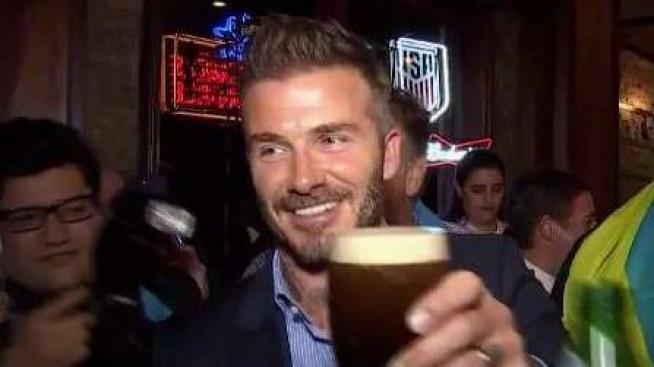 Beckham celebrated the announcement at Miami's Fado Irish Pub with fans, friends and officials – sharing what appeared to be a pint of Guinness with fellow soccer aficionados and toasting to the new team. "Obviously excited to be here, excited to be with our fans. It was a big day – enjoyable. We're going to enjoy it," Beckham said before entering a round of cheers while hoasting a beer-filled glass. The original plans to bring that expansion team, part of a deal in Beckham’s original contract with the league when he played for the Los Angeles Galaxy that allowed him to one day purchase an expansion team, had been delayed due to issues over a possible stadium site. Original stadium sites that were denied for various reasons included near Port Miami and the AmericanAirlines Arena as well as next to Marlins Park. The ownership group reached a deal in 2016 for land in Overtown to build a 25,000-seat stadium, but the last piece of land was not sold to the group until last summer — while some businesses and community members have waged legal battles to stop further plans for building that stadium. MLS will be hoping for a longer stay in the South Florida area. In 1998, the Miami Fusion began play at Fort Lauderdale’s Lockhart Stadium, due to a conflict that prevented them from playing inside the former Orange Bowl stadium as planned, before folding after the 2001 season.